How to Pack for an Adventure! Packing 6-months’ worth of life into one suitcase (without severely compromising the integrity of the zippers) can be a challenging endeavour. Through my past experiences traveling and living abroad, I have tried in earnest to perfect the packing process, with the hopes of packing more and more frugally each time. I have learned that being conscious of what I bring with me to a place is not only important for the physical items but also the spiritual, mental and emotional. And so I present to you a few of the essential items that I brought with me this time (although it is an ongoing process). Extra space in the suitcase – for those physical items and souvenirs that I inevitably want to bring back and share with my loved ones, but more importantly, for the intangible things that I pick up along the journey. The life lessons and the challenging moments in which I learned something essential about myself. The random pockets of space end up filled with gratitude, a gratitude for having the privilege to see the world in a new way. And lastly, one must not forget the humility that I gain in realizing that I am one small speck in a beautifully complex world. 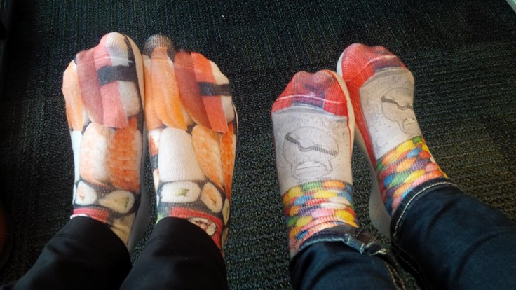 Travel socks – As they go along, the socks (and the traveller) will tread on new territory, will become stretched out, and may even be pushed to the last fibre of their being… sometimes not knowing if they will be able to withstand the whole journey. But in the end they endure. And as they are worn for the flight back home, I may notice that they are a little more weathered and have a few new holes, but the socks now tell a story and become a testament to the journey that took place. Travel pillow – something comfortable for the times that I may be exhausted (physically, mentally and emotionally) and just need to relax into something familiar in order to reset and refresh, allowing me to begin again with a new perspective. The journey can be long, but it is well worth it. I just need to remember to take the time to rest and focus on self-care in order to be the best version of myself for other people. Sunglasses – for the equatorial sun but more importantly as a reminder to always look at things with a fresh and positive perspective, keeping in mind the prejudices and judgments that I bring with me and the ways in which I tend to see the world. Sometimes I have to let it all go and remind myself to blink again, this time with a new set of eyes and a more open heart and mind. I have arrived safely in Bolivia and can report that my key items have so far been serving me well. I bid you all adieu until the next addition. Carolle is doing an internship with Chalice and Levántate Mujer Foundation in Bolivia.